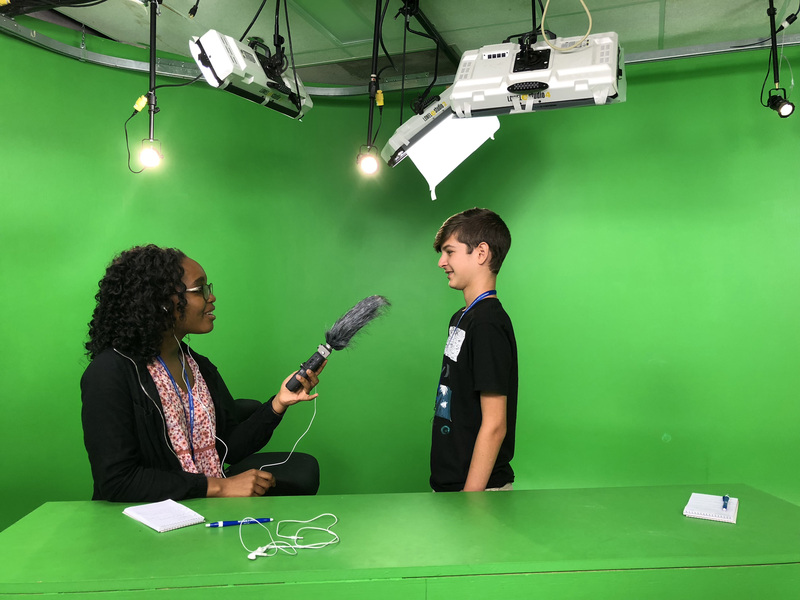 J-Campers practice their interviewing skills. Innovation J-Camp is a five-day workshop held at the Center for Innovation in Media in partnership with the College of Media and Entertainment. 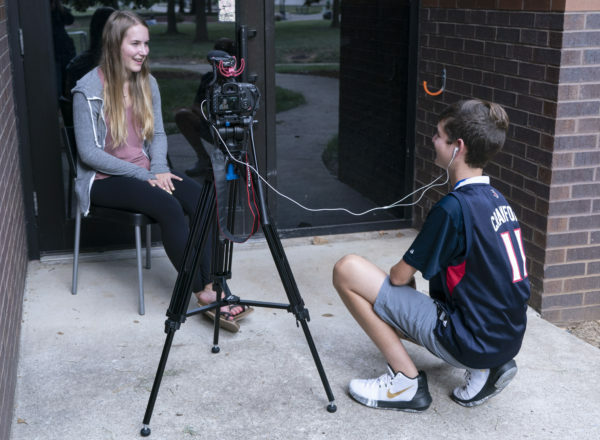 Innovation J-Camp is perfect for high school students interested in telling stories for mobile, social, digital and video audiences. 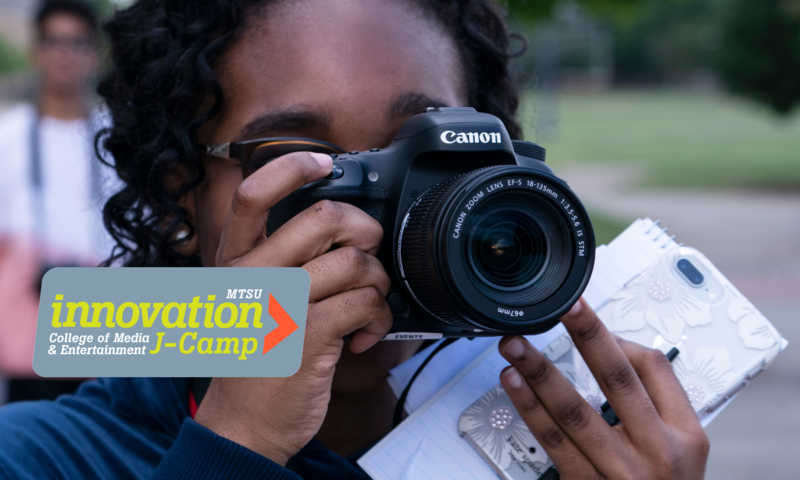 Students who will begin their freshman year in high school in the fall of 2019 are eligible for Innovation J-Camp. The camp will be held July 8-12, 2019 at the Center for Innovation in Media at the College of Media and Entertainment at Middle Tennessee State University. Cost of the camp is $150, lunches included. Working on the J-Camp podcast in the studio. 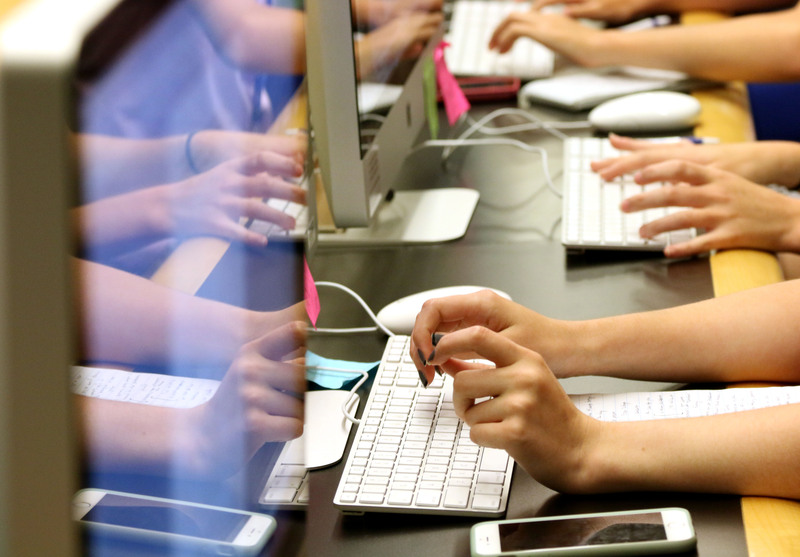 The Center for Innovation in Media is home to all of MTSU’s student media. 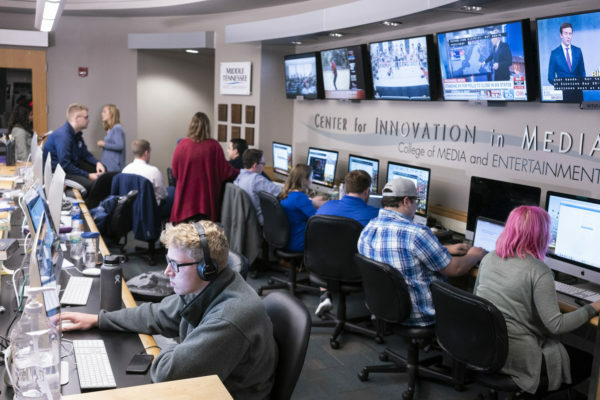 The Center for Innovation in Media, better known around campus as, the CIM, is home to Middle Tennessee State University student media and a professional National Public Radio station. The CIM houses Sidelines, an editorially independent daily digital and mobile news site and monthly printed newspaper, MT10 and MT10 News, a television station that produces five student newscasts each week and a variety of entertainment programming, WMTS 88.3 FM, a student run radio station with music, news and talk and Match Records, a student run record label that helps develop, record and promote signed musicians. The Center is also the home of WMOT Roots Radio 89.5 FM, a professional NPR station playing Americana music, original roots music programs and news. WMOT is produced by professional radio staff and MTSU student staff and interns. In addition to student and professional media, the CIM is a place of innovation and exploration in media. Through partnerships and creative teamwork the CIM helps create mobile apps, data visualizations, data bases, websites, video projects and other media. The CIM is a part of the College of Media and Entertainment and is located on the first floor of the Bragg Mass Communication building. Val Hoeppner is the director of the CIM. Hoeppner has worked in digital, mobile and multi-platform journalism for more than 15 years. 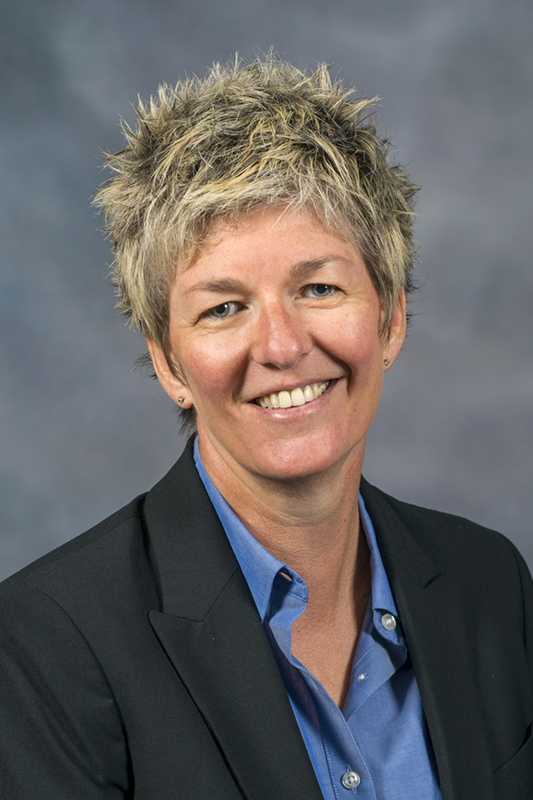 Hoeppner was multimedia director at the Indianapolis Star and later worked at the John Seigenthaler Center in Nashville as the director of education for the Diversity Institute. Hoeppner is also a well known media strategist and trainer, working with companies throughout the United States. She is an instructor for MTSU, the Poynter Institute, the Newseum Institute, Native American Journalism Fellowship, and APME News Train. Hoeppner is the director of Innovation J-Camp and will be the lead instructor. Hello! Хочу не пролететь с заказом рекламы в интернете. Помогите мне как не допуститьэтого? Я купила салон красоты, который уже 10 лет работает. ОН красивый салончик. Муж от моего выбора был в шоке. Доходы у моего салончика очень маленькие оказались. Вот решила заказать сайт и порекламироваться. Советуют Друзья Web-студию Юлии Беззубовой. Biliyorsunuz bir çok yer NBA tahmini veriyor, hatta bu web sitelerin neredeyse hepsi bot programlar ile maçları analiz bile etmeden ziyaretçilerine NBA tahmini veriyorlar. Basketbol bahis tahminleri verebilen web site sayısı bildiğiniz gibi maalesef çok ender. 20 senelik basketbol uzmanı ekibimiz ile eşsiz kaliteli analizler paylaşıyoruz. Basketbol tahminlerinin daha fazlasını yaparak maçlar başlamadan maçın nasıl başlayıp şekilleneceğine kadar usta işi analizler paylaşıyoruz ve NBA maçları hakkında çok detaylı tespitler yapıyoruz. Çoğu zaman skorları bile bildiğimiz oluyor. NBA tahminleri ve NBA ile ilgili doğru analize ihtiyacı olan tüm kullanıcıları adresimize davet ediyoruz. Botla yada başka sitelerden kopyala yapıştır tahminlerle işimiz olmaz. Ekibimizle saatlerce inceleyerek tüyoları ilettiğimiz için az ama öz nba analizi yayınlıyoruz. Aynı zamanda futbol ve tenis karşılaşmaları iddaa tahminleri ve banko analizler güncel olarak paylaşılıyor. Herkesi bekliyoruz.